Every so often, we get e-mails in the middle of the night asking why an LAPD helicopter is circling above and shining a light down on their street. If you&apos;ve lived here long enough, we all know this is a common experience. After all, the LAPD, who boasts that they have the "largest municipal airborne law enforcement operation in the world," has 17 helicopters and one twin engine plane (unconfirmed, but we heard they may actually have just bought a new helicopter, making that 18). 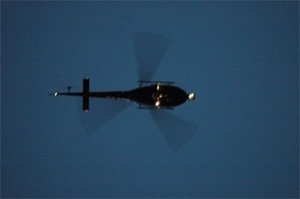 With that said, helicopter noise is an ubiquitous aural sensation that&apos;s here to stay. So if a helicopter is circling around your home or work for a good period of time, they are happy to take your call at 213-485-2600 and let you know. Of course, it would be much more efficient if they just used Twitter or some broadcast method to inform the public when one is circling for ten or more minutes. And it&apos;s good time for that considering Captain James Miller from the Van Nuys Division just took over the Air Support Division and that the City Council this week mandated departments to look into using Twitter. In fact, one of the reasons the LA Fire Department alerts the public when their helicopters are being used for a hoist or lost hiker search is to avoid a mass of phone calls asking why one is circling above their home. And it works.